Snows sleds are designed to provide an exhilarating ride down a snowy mountainside. They come in a range of shapes and sizes, with toboggans, snow saucers, and tubes being some of the most popular. If you live in an area where you get a significant amount of snowfall each winter, or take skiing holidays, a snow sled is definitely an item you need! We reviewed dozens of snow sleds to identify the best of the best. We looked at features including the type of material each snow sled was made of, whether it was easily transportable, and if it had carry handles. The classic styling of this metal and wood Flexible Flyer snow sled hides a wide range of modern features. Out of all the snow sleds we reviewed, the Flexible Flyer Metal Runner Snow Sled came out as our top pick. The timeless design of this wood and metal traditional toboggan sled also includes a whole range of modern features, making it one of the fastest and most maneuverable sleds on the market. For our Top Pick, we selected the classic Flexible Flyer Metal Runner Snow Sled. The traditional design of this sled makes it instantly appealing, but it also has a host of modern features which give it the edge over many of the other slow sleds we reviewed. The powder-coated steel runners are both eye-catching and functional. The small surface area decreases friction, which will help increase speed! These runners can also be waxed for ultimate performance. The top of this sled is made from a smooth birch wood, and gives you the options of steering in a variety of ways. You can either sit on the sled and use your feet on the steering bar, or lie down and control the bar with your hands instead. The final option is to attach a rope (not included) to the pre-drilled holes on the steering bar, and use this to control your direction. This snow sled uses a lightweight luge design to provide a safe and exhilarating sledding experience. For our Runner Up Pick, we selected the Zipfy Freestyle Luge Snow Sled. This lightweight and compact snow sled is engineered to suit packed snow slopes, with a light topping of fresh powder. The luge design allows you to steer this snow sled with ease, as well as easily stop by dropping your heels down. The rugged design is made from a high-density polythene plastic, which is UV resistant and won’t fade in the sun. Many reviewers on Amazon are pleased with the high quality of this sled, combined with the excellent price point. The fact that it can be used easily by sledders of many different ages is also a great advantage. This roll up snow sled is portable, durable, and a great, budget-friendly price! If you’re looking for a snow sled on a budget, then the Flexible Flyer Flying Carpet Lightweight Roll Up Snow Sled is a great option. This snow sled provides excellent value for money, costing less than $10. The soft polyethylene of this sled means it can easily be rolled up for travel, yet when unrolled it’s still large enough for adults to use with ease. The Flying Carpet sled features soft rounded edges, and two handles on one of the short sides. The handles are punched out of the material, and provide the perfect way to hold on to the sled while both carrying it up the slopes, and sledding down them. This snow saucer sled uses powder coated metal to provide a speedy sled, with plenty of spins! 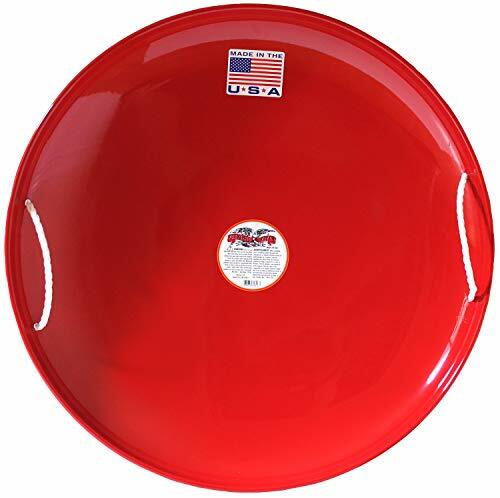 Our pick for the best snow saucer snow sled is the Flexible Flyer Metal Snow Disc Saucer Sled. This classic snow saucer is made from a thin layer of heavy gauge metal, which guarantees a durable and fun sled. The powder coated metal provides a super slick base, meaning you’ll fly down the slopes. In addition, the round saucer design means you can spin this saucer for next-level sledding fun! This compact snow saucer measures just 4 inches high, and can be stacked together when storing, or transporting to your destination. This toboggan style snow sled is built for speed, and comes with a cold-resistant coating to help stop the cold creeping in. Our pick for the best toboggan snow sled is the Slippery Racer Downhill Sprinter Toboggan Sled. This sled is made from a heavy-duty yet flexible plastic. The slick-coated base reduces friction, to ensure maximum speeds down the slopes. The coating is also resistant to the cold, meaning you can enjoy sledding for longer. The built-in rope handle means it is easy to pull this toboggan sled back up the hill. The long length of this sled means you can fit 1 – 2 riders in, making it perfect for adults and kids to use together. The integrated side handles are also useful for adding stability when sledding. Reviewers of this sled commented on the quality, and the fact it stood up to a good few seasons of use. If you enjoy regular winter holidays, or live in an area with seasonal snowfall, a snow sled is a great investment. They’re a fantastic way to entertain younger children who perhaps aren’t ready to learn skiing or snowboarding just yet. You can achieve the same thrill of a fast mountain descent as when skiing and snowboarding, but with far less investment in equipment. This makes snow sleds an excellent choice of you want to enjoy winter activities without having to purchase a lot of equipment. You may want to wear skiing googles when sledding, and you can find our review of the best choice of ski goggles here. Sleds are a great option to keep in your RV when vacationing in winter. Some of the smaller, more compact models can also be easily stowed in the trunk of your car. Weight. Some of the lightest snow sleds can weigh less than a pound. Others tip the scale at around 12 pounds. If you’re looking for a snow sled for young children to enjoy independently, then a lighter model can give them the freedom to pull it back up hills themselves. Lighter sleds are also great for travelling with. Heavier sleds can be more stable, and are suitable for keeping at home and enjoying as a family. Shape. The shape of a sled will affect how well it can be steered. Rectangular, toboggan style sleds are easier to steer, and some have steering bars, or a rope handle to help affect your direction when sledding. Round, snow saucer style sleds are less easy to steer. These will often spin as they go downhill. Some sledders love this, but it may not suit younger children. Inflatable or rigid. If you’re heading away on vacation and are short of space, then an inflatable snow sled such as a snow tube is a great way to make sure you can still enjoy sledding. These snow tubes pack down to a very small size, and can be inflated when you reach your destination. One downside, of course, is that they’re more prone to damage. Rigid sleds are more durable, and are easier to steer thanks to the fact they often have either brakes, or a rope at the front to help aid your direction. They’re heavier and take up more space though, which you may want to consider if you’re traveling. What is a snow sled and how does it work? Snow sleds are something you sit or lie on, and are designed to help you slide downhill on snow. They have smooth bases, sometimes with thin runners. The bases are designed to reduce friction between the sled and the snow, which allows you to go faster. Why does a heavier sled go faster? Physics gives us the answer to this question. If all other factors are equal, then a heavier sled will usually go faster than a lighter one. This is because gravity will affect both sleds in the same way, but there will be more friction on the lighter sled. This means it will typically slow down faster. There are many other factors that do affect the speed of sleds, including air resistance and drag. You can read more about the physics of sledding here. Is powdery snow good for sledding? It depends on what you’re looking for. Powdery snow is good for allowing soft landings at the end of your run, but you won’t go as fast as with some other types of snow. The best surface for snow sledding is packed powder. This provides a smoother surface, with less friction. The result is you’ll find your sled travels faster on packed powder than it does on powdery snow. How do you make a plastic sled go faster? To do this, you’ll want to reduce the amount of friction between your sled and the snow. Coating the underside of your sled with a thin layer of wax, oil, or cooking spray can provide a smoother surface which is less likely to pick up snow and ice. We looked at 20 other snow sleds. While they didn’t make our 5 best snow sleds, they’re still the best of the rest and each is a great option. The information you’ll need to compare each one is included with the listing. This soft fabric snow saucer is made from a tough waterproof canvas, combined with a slick coated base. It can be used on its own, but also fits inside Bradley Colossal 57 – 60″ snow tubes for additional padding. If you have a family with a lot of kids, they’ll love sliding down the slopes on this linkable disc sled. Simply connect multiple sleds together using the heavy-duty connectors. This foam sled provides all the thrill of a traditional snow saucer, combined with a soft padded base for ultimate comfort. This 3-pack of snow saucers is perfect for family fun. The high density polyethylene base is super slick to allow this saucer to slide over the snow with ease. This officially licensed Batman snow saucer features an exclusive cold-resistant treatment, meaning you can keep sledding for longer. This toboggan style sled includes brakes on either side. These brakes can be used for slowing the toboggan, but also to help you steer down the slopes. 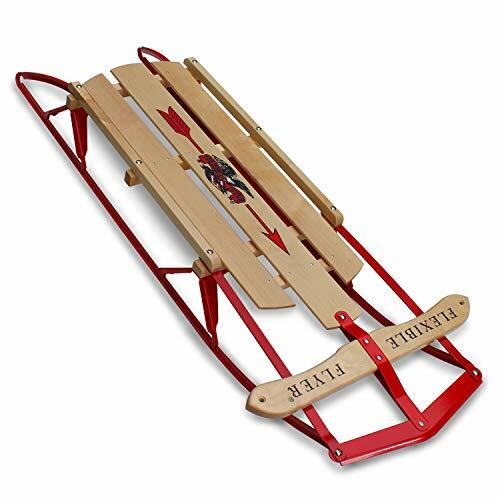 This classic wooden sled has metal runners to help you slide smoothly through the snow. The flexible steering bar allows you to maneuver this toboggan with ease. This toboggan snow sled is made from a durable, heavy-duty flexible plastic. Suitable for between 1 – 2 riders, it’s a great choice for families with small children. 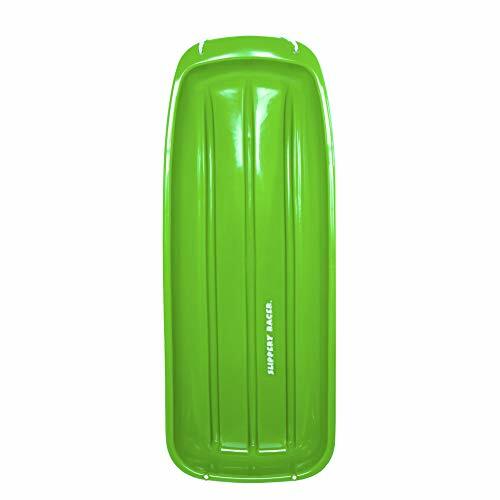 This durable plastic toboggan sled is coated with an exclusive cold-resistant treatment, which also creates a smooth base. The ergonomic shape of this sled provides excellent support for your downhill sledding expeditions. This super large snow tube measures 47″ in diameter. The heavy duty plastic it’s made of is 0.6 mm thick, and designed to withstand bumps and scrapes. This snow tube is designed with a double set of handles, meaning it’s perfect for 2 people to enjoy together. If you’re looking for a fun and eye-catching inflatable snow tube for your next vacation, this option comes in a range of designs including a unicorn, ice dragon, polar bear, penguin, or flamingo! This snow tube can be towed behind a vehicle for even more speed on the snow. 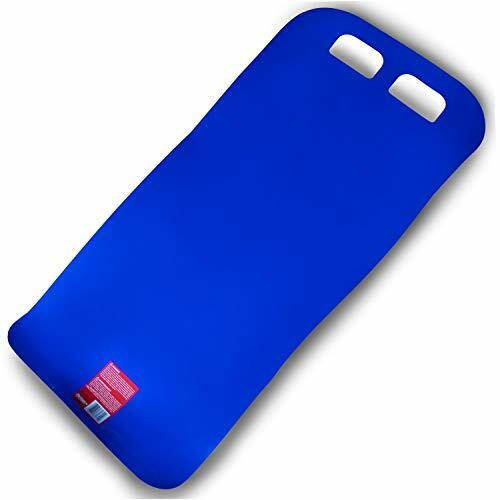 It also has a solid polyethylene bottom which is both durable and tough. If you’re a family with a young child who doesn’t want to miss out on the fun in the snow, this supportive baby sled is the perfect option. This toboggan style snow sled is specially designed to provide an excellent level of control, including two brakes for easy stopping. This durable toboggan sled includes an impressive limited lifetime manufacturer’s warranty. This two-pack of lightweight snow sleds are perfect for short vacations where a compact sled is required. This inflatable snow tube is perfect to take on vacation if you’re looking for a budget snow sled for kids to enjoy.